Are you buying for someone who loves animals, the outdoors or a new adventure? Give the gift of Scuba Diving! 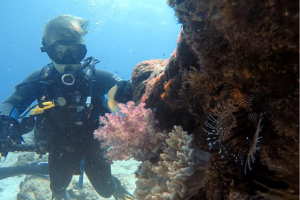 They can experience scuba diving on one or more of the Sunshine Coast's beautiful local reefs and they will amazed by the beautiful coral and magnificent marine life. Leaving from Mooloolaba, we explore reefs from Noosa to Caloundra. No diving experience? No worries, just purchase the Introductory Dive option, no experience is necessary. "We went on a beautiful Sunday to the Reef off Noosa. Absolutely stunning what we saw. The reef was full with colourful fishes... Definitely recommend all the dive trips these guys are doing."